A woman, her four-year-old son, and a man were injured when they were hit by bricks which fell from the top of a three-storey building. 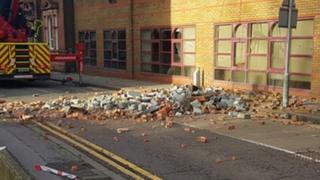 The masonry fell onto them in Church Street, Epsom, in Surrey, just before 13:00 GMT on Thursday. The site is part of engineering company Atkins, whose 330 staff have been told to work elsewhere or at home while the building is assessed for safety. It is not known what caused the bricks to fall or if it was weather-related. The boy and his mother were taken to St George's Hospital in Tooting, south London. Police said their injuries were not thought to be life changing. The man suffered minor leg injuries. The Health and Safety Executive said it was aware of the incident and making initial enquiries. A spokesman for Atkins said its first thoughts were for the injured, and it wished them a swift recovery. "We will be working with our landlord, the emergency services and the local authority to investigate what has happened and take steps as quickly as possible to ensure the building is safe for members of the public and those who work within it," he said. Church Street remained closed to traffic and pedestrians overnight for safety reasons. High winds and poor light made it unsafe to install scaffolding until Friday.